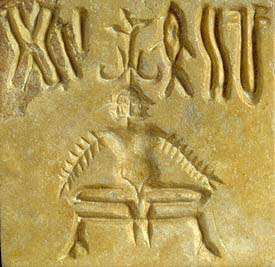 Did ancients from a long past Golden Age practice a prehistoric yoga? Did they have access to a deep wisdom and amazing knowledge that has now been almost completly forgotten or now only understood in a distorted form? 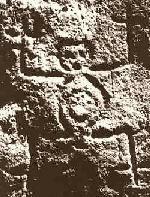 Did some of the Ancients from prehistory encode some of their yoga techniques, mudras (hand gestures) and postures of power into statues and carvings? This webpage will collect pictures of ancient statures from all round the world which display unusual postures and other note-worthy features. "Every position assumed and every gesture performed by our mortal body may be said to imprint its seal on the Ether, and sent forth a continuous stream of vibrations that impress the atmosphere. But to be really effective there must be a deliberate and intended arrangement of the body or parts of the body. Such an arrangement is nothing but the yoga of mudra. It is interpreted as being able to bring the physiological system in harmony with the cosmic forces and so form a magical microcosm through which the macrocosm can be represented, channelled, and utilized. The mudra in all its variations is, therefore, a traditional body pattern; an archetypal posture of performed occult significance. We perform mudras in every action, every moment of the day. Each action is a symbol of our underlying mental and physical condition and results because of the various energy patterns forming within our being. These patterns determine our personality character and mannerism and expressions. Thus our every moment is an expression of our inner-nature. Consciously performing mudras allow us to become more aware of inner energy and to control it so that we make the most of each moment. The effect is total, at once subtle but powerful. In this way, we learn to integrate our dissipated thoughts and actions, so that life becomes a graceful flow of energy and understanding. Our whole being can then become a mudra, a gesture of life within, reflecting into our external life." 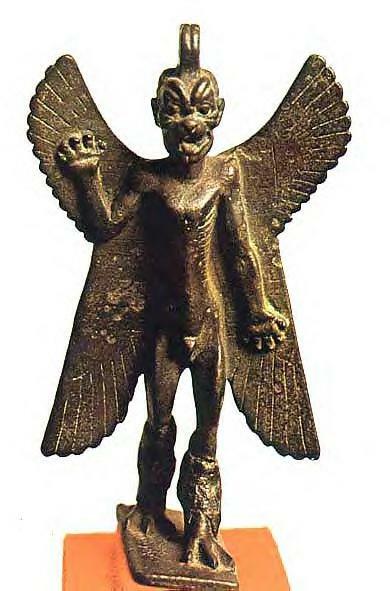 Pazuzu--A demon from Babylonian myth, sometimes called Zu, who stole the tablets of destiny from the dragoness Tiamat. The tablets were recovered but won back by Marduk who conquered Tiamat. Pazuzu--A wind demon,who was normally shown with a grotesque face,four wings,birds legs,animal front paws and a scorpions tail. Although king of the evil demons,Pazuzu was thought of as benevolent. Bronze amulets of Pazuzus head,worn to protect women in childbirth against the attacks of the she-demon Lamashtu,were very popular in the late Assyrian and Neo-Babylonian periods. 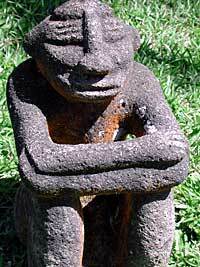 Does this ancient statue from Costa Rica show a useful posture or is it merely a mundane sitting posture? The pose is very similar but not identical to the one below. 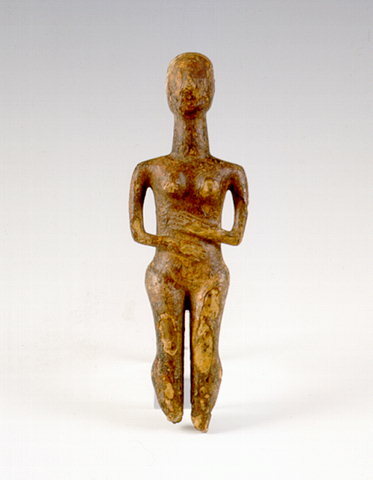 Reproduction of shaft-tomb figurine, by Soledad Garcia Baron and her brother Rodrigo, from San Antonio Tlayacapan. Lake Chapala Area Prehistory. Does the posture shown in this ancient carving from Columbia have any significance from the viewpoint of yoga? 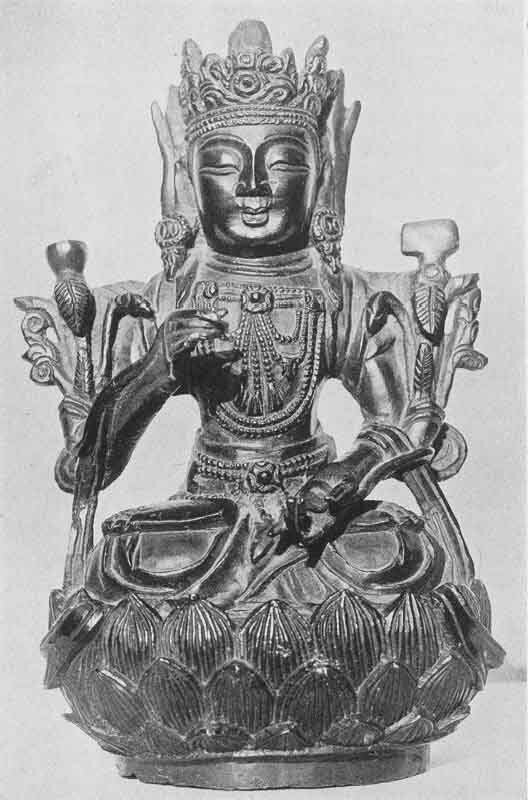 "One of the two oldest known bronzes in the world. It is a symbolical figure of Mu as the mistress and ruler of the whole earth. It was made in either Mu or in the Uighur Capital City over 18,000 years ago." Standing Buddha. Ho Phra Keo, Laos 17-18c. The statue displays an ususual mudra, called "looking at the Bodhi tree". Marble figurine from Akrotiri. 3rd millennium B.C. 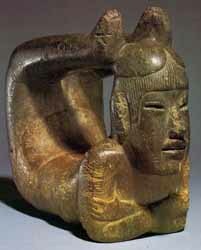 This Olmec Statue depicts a shaman in what is very similar to the Scorpion Asana of classical yoga.